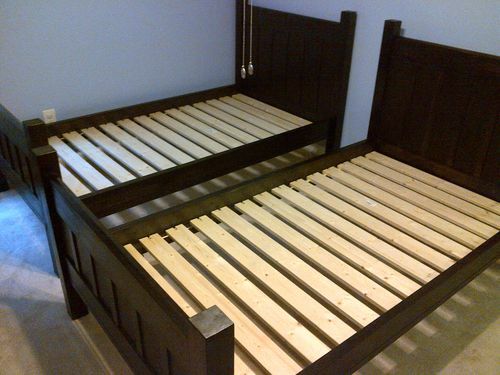 Hello again all, I’m almost done with the bunk beds, At this point they are two twin beds. 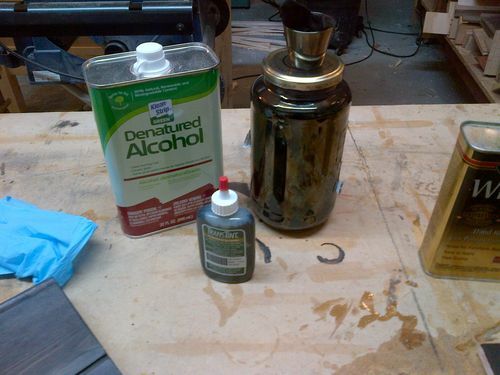 Here is the stain I used which worked out pretty well. I used Dark Walnut Transtint dye mixed with DNA. I used DNA instead of water so I wouldn’t have to raise the grain first. However water may have worked better because it doesn’t dry as fast giving the stain more time to soak in. No real issues though I think it worked out. The varnish used was MinWax satin poly in the round can thinned out with MS.
Not many pics of this process, hard to take pic with gloved hands with finish on them. The best I could do is having the wife come in and take a pic. I rubbed out the first coat of varnish with steel wool. I got the hang of brushing on the poly with a sponge brush (you can still get quality US made ones at ACE hardware) so I made the second coat thicker and left it at that. 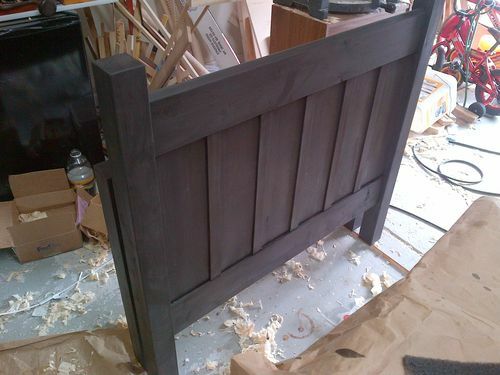 I just rubbed it down again with steel wool and applied some dark wax. I’m quite happy with the results! And more importantly, the boss likes them to. 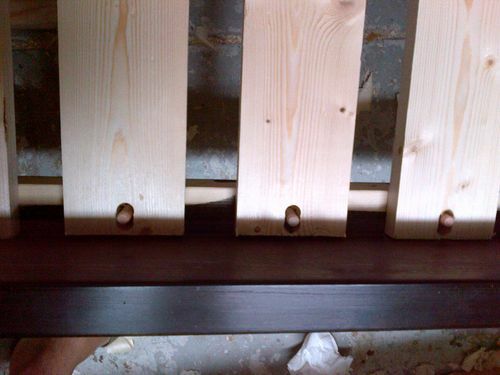 Next I had to prepare the slats that support the mattress. 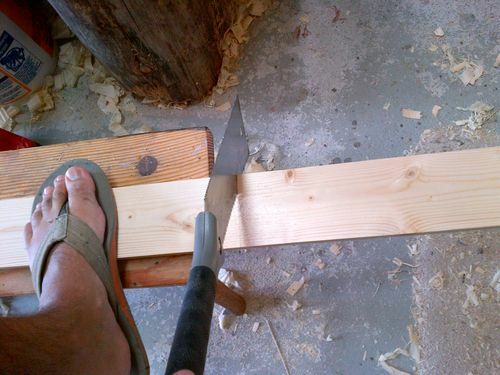 The 10’ 1×4’s I used were a little long for the chop saw so I cut most by hand. I know, I need a better cross cut saw, I have one waiting to be restored. Then I knocked off the corners of the slatts. 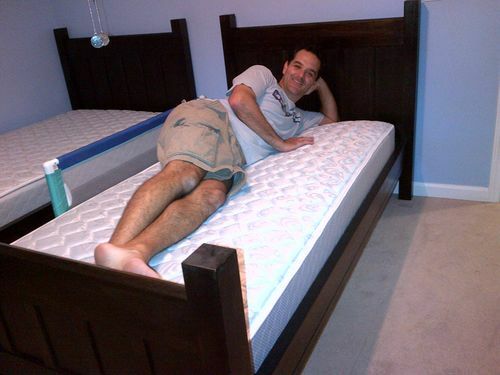 Here is a tip I picked up from Jeff Miller’s book on Beds. 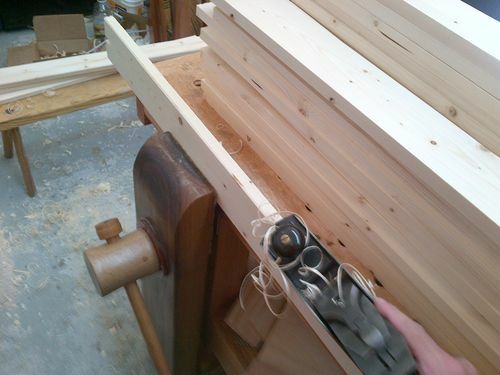 The boards are notched and held in place with a dowel. This allows them to move and act as springs. 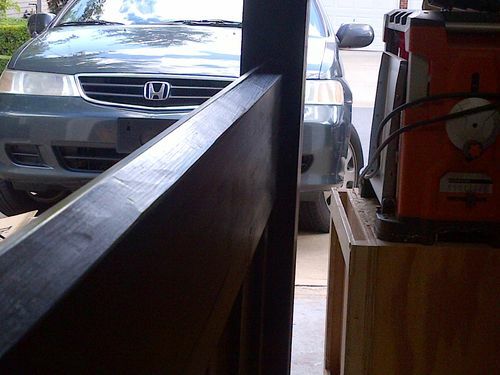 I drilled out the hole on the drill press and then cut out the notch on the band saw. At first I was doing it all on the Drill Press which is why these look a little rough. This pic was taken before fully cutting the notch on the BS. And Voila! 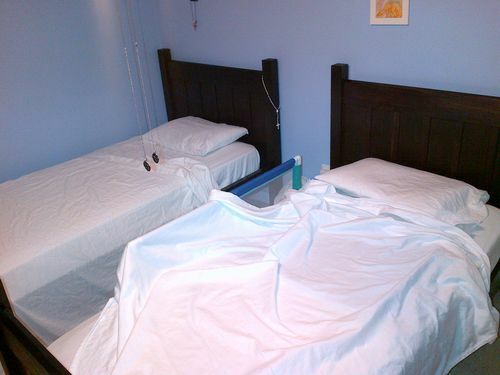 Two fully functional twin beds! This pic shows some of the character of the wood which is hard to see with my crapy cell phone camera. And the best part, subtle traces left by the hand planes which I love. And here they are with some bedding on them. 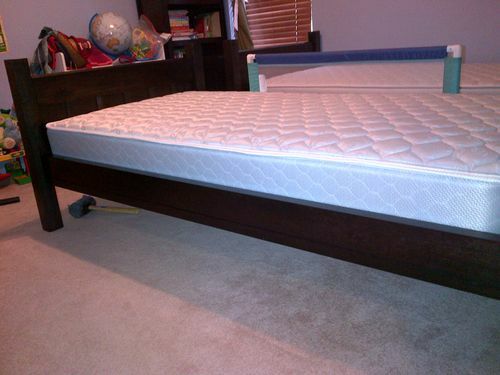 Next I’ll build the guard rails and the ladder so I can stack these beds. Thanks for looking. Questions and comments are welcome. Spectacular Mauricio! They really came out nice. Great job man. The lack of Crocs proves that Shane’s intervention was fruitful. Superb stuff Maur, thank you for taking us along. Great looking beds. I like both the style and finish you achieved. 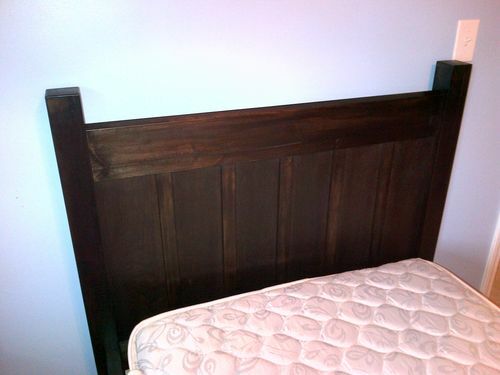 I am starting a twin bed project soon, and was wondering did you use solid posts or did you laminate them? Nice project. They will get a lot of use for a long time. Those look great, Maur! 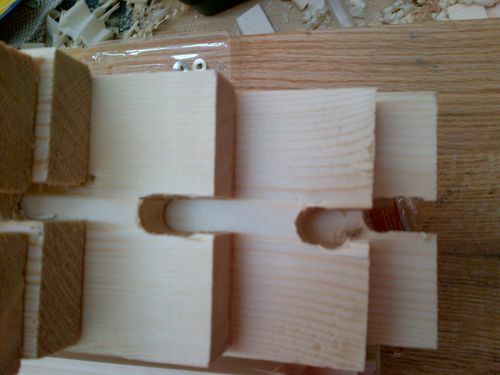 I hadn’t seen the slot and dowel thing before, but it makes perfect sense. You know a Bondo/Croc pic would move everyone to silence! Outstanding pieces that will be treasured for generations. Congratulations. 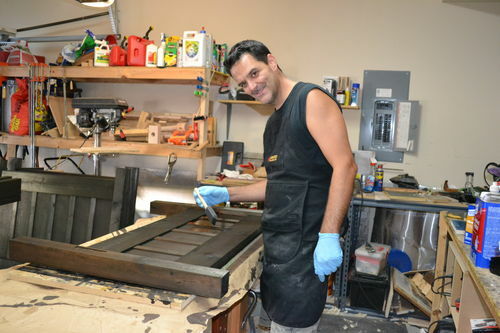 Mauricio, this has been a very informative blog and I have picked up some great ideas. 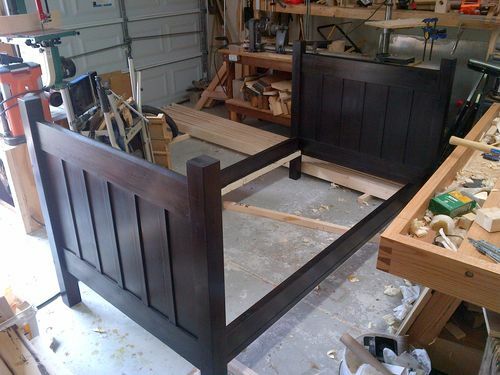 The finish on the beds look great. Almost done ! Great looking beds and the plane marks do add character. Thanks Willie, I wish I could get solid 3×3’s at my local HD but I had to laminate two 2x’s. Don, thanks my friend, that’s a beautiful thought. That reminds me I need to figure out how to sing these, I always forget that part. Thanks Jay! Yeah and I still owe you guys Bondo pose on the bench! Thanks Kevin, that would have been shocking, that’s why I make sure to keep the Crocs out of the shots now :-) I pretty much only use them to cut the grass now. Thanks Mos, but its so dark I might as well have painted them. They look better in person though, a lot more wood grain showing through. Thanks Lee, I’m glad you found it useful. I couldn’t find a lot of info on the type of beds I wanted to build. I’ve had to piece together and figured a lot of this stuff out on my own so I just wanted to pass along the little knowledge I’ve acquired. Thanks Fabrice, I love the plane marks to, I kind of wish I would have putt a little more camber on my smoother to make them a little more obvious. Awesome job Mauricio, you did it! If you’re gonna sing you’ll need to build a guitar. I am not sure if I am more proud of you for breaking the Crocs addiction or buiding the sweet pair of beds. Looks like they turned out great. You guys keep doing top notch work outta pine, and you are going to drive me to try it. Never thought I could think/say that before. Job well done, look forward to seeing them stacked up. Looking great, Mauricio! Nice job coloring the Borg pine, and thanks for sharing your recipe. You should be proud of yourself, Maur! 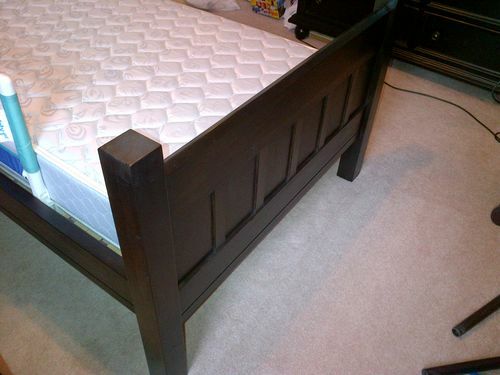 The beds came out great. I like the hand plane marks too—I’ve left them on mine before too. Apparently, guns are still legal in Georgia, because there’s a picture of two guns in the one your wife took (haha). I caught the Bondo pose too. Very nice. I REALLY like how that finish came out! I need to source up some dye me thinks..